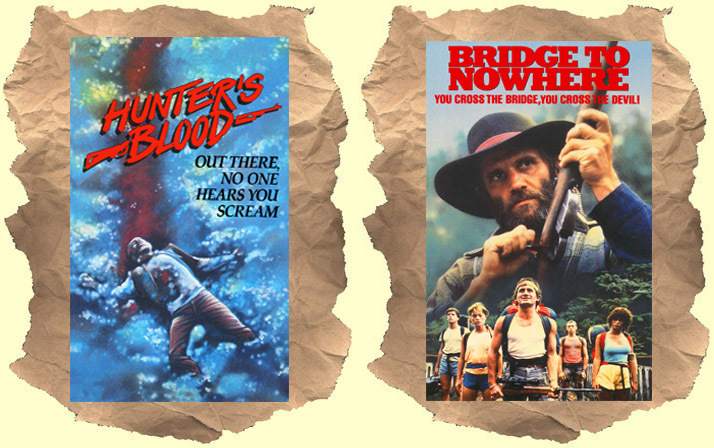 Hunter's Blood: Here's a great Deliverance / Rituals rip-off with plenty of exploitation-style blood and guts. Five hunters including Clu Gulager, Sam Bottoms and Joey Travolta are on their way to do some camping and hunting in the Arkansas woods. In the local town they run into rednecks and hillbillies. But out in the woods is the real danger - scary inbred poachers (including Billy Drago and a drooling Bruce Glover) who set about hunting these city boys down for sport. Includes a decapitation, a face blown off, stabbings, etc. Fast paced low-budget winner that doesn't skimp on the red stuff. Bridge to Nowhere: Another tale of city folk getting in trouble out in the woods. This time it's a group of teens hiking into the amazing New Zealand wilderness to find "The Bridge to Nowhere" (a real location). Along the way they cross paths with a mentally unstable hermit who ends up hunting these kids down like animals. As the villain, the great Bruno Lawrence gives weight and a realistic feel to his intense mountain man who snaps when the harmless kids enter his world. An overlooked import winner. With an interesting 80's style soundtrack and score.